In an area or moment of particular artistic fertility there will always be pockets of local style, delimited by geography and chronology, and defined by local needs. The long Italian Renaissance is the period I know best, and one in which this is most certainly true: the Florentine Quattrocento, for example, is different in many ways from the Venetian Cinquecento, and again from the styles that appear in some smaller or more isolated zones. It can be fascinating to look at some of these specific moments and places to see how artistic style responds to various input. 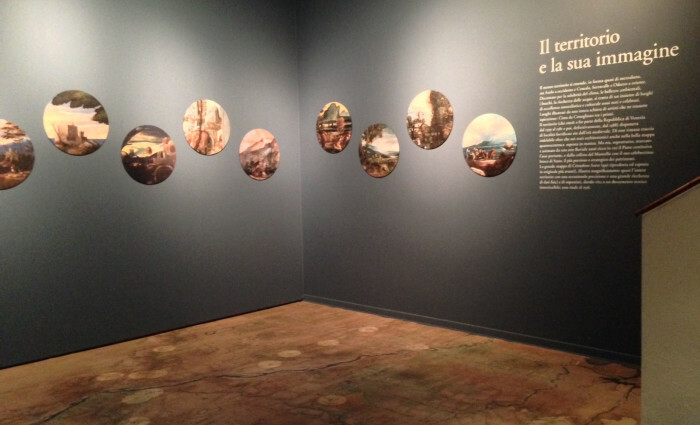 The title of the exhibition at Palazzo Sarcinelli in Conegliano and its surrounding area from March 1 to June 8, 2014, can be translated as “The Restless Cinquecento: from Cima da Conegliano to the bonfire of Riccardo Perucolo” and it addresses the artistic style of the area around Conegliano, near Treviso, in the first half of the Cinquecento, a time of artistic fervour that died out with the influence of the Counter Reformation. 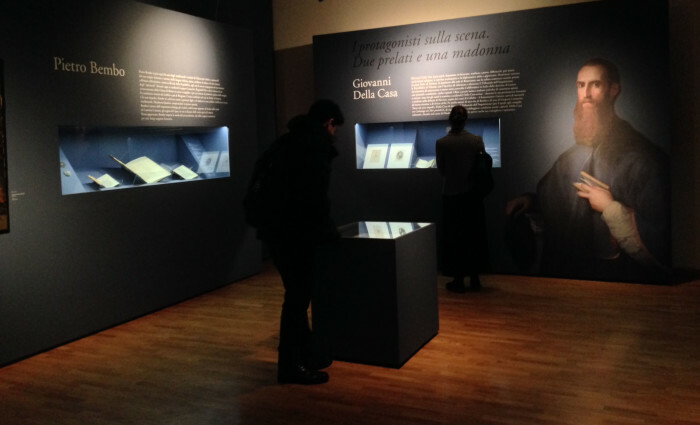 The exhibit is curated by Giandomenico Romanelli (recently retired after 33 years as director of the Fondazione Musei Civici di Venezia) and Giorgio Fossaluzza (professor of art history in Verona and a specialist on the Vivarini family of artists). An exhibition as specific as this could go either way – even with the same paintings involved, it could be very boring, or absolutely enthralling, depending on how you tell the story. And it’s quite the story: an intricate weaving of protagonists who produce painting and poetry, a narrative of events and patrons, of closely related locations, patrons and projects. Like all good storytelling, it involves people, places and things (title of my recent workshop on museum storytelling) and also time. Time and place are the fil rouge of the exhibition, and the first two rooms we encounter make this clear. The first room provides the introductory wall text, but most of the space is taken up by a timeline on which are placed the various actors we’ll meet, starting with the town’s favourite artist, Cima da Conegliano, and ending with the burning at the stake, in 1568, of an artist I’d never heard of named Riccardo Perucolo, who had painted a decorative frieze in Palazzo Sarcinelli, location of the exhibition. The wall text explains that this choice of end date is not at all arbitrary. 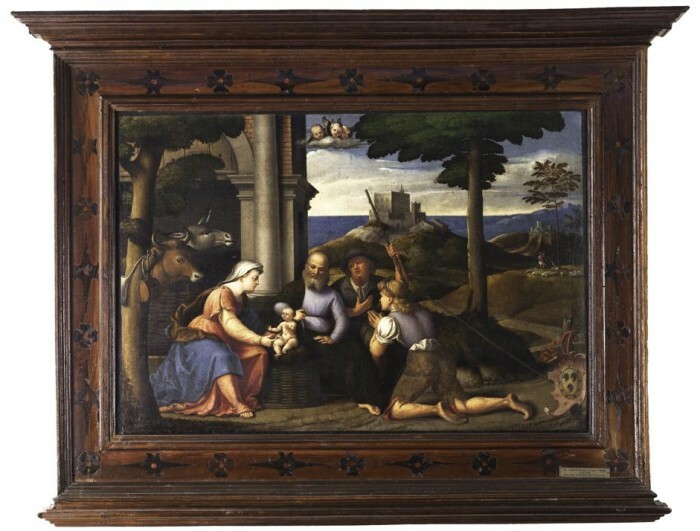 The fervent Renaissance in and near Conegliano really starts with their local artist, Cima, and involves others from close by, some of whom you might have heard: Palma il Vecchio, Paris Bordon, Marco Basaiti, Francesco Beccaruzzi, Sebastiano Florigerio. Joining these “locals” are Pordonone (Giovanni Antonio de’ Sacchis from the Friulian town of Pordenone which is 35km away) and the great Titian. Missing from this list is Pomponio Amalteo, successor to Pordenone who appears in the exhibition’s itinerary around town. 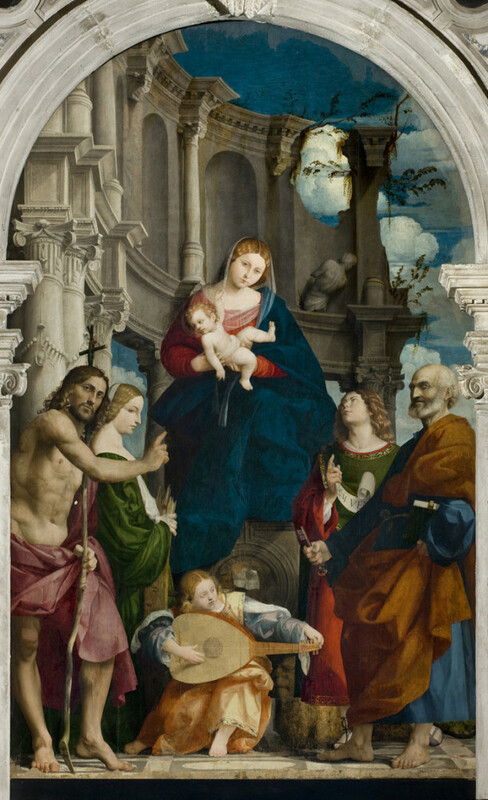 These artists, in the first decades of the sixteenth century, in the well established humanistic circles of Pietro Bembo, painted for ecclesiastical as well as lay patrons in a vivid style with a beautiful integration of nature and subject, yet that was just slightly different from what was being done in Venice. This style is provincial, not in any derogatory sense of the word, but meaning closely linked to a “province” or “territory”. Place, territory, is the second element we encounter in the exhibition path, which takes us into a room with a floor that reproduces a contemporary map of the area near Conegliano. The original large map from 1556 is displayed later in the exhibition, but here we see a video about its restoration, and can walk on it, closely studying the relationships between towns. The map is of the “Trivisan”, an area that is not a political division but one defined by common customs; it was officially part of the Republic of Venice from 1388. The area forms a semi circle from the town of Asolo in the west and Ceneda (the closest Bishopric) in the east, that on a modern map doesn’t seem to have anything to hold it together, but that this historic one makes clear – an area joined and separated by the major river Piave and its smaller fingers, bordered at the top by mountains and below by plains. Having established what, when and where, we meet “who”. The exhibition funnels us in like a well written screenplay, in which the director zooms in with an aerial shot to meet the protagonists in a single room. The artistic ferment takes place not coincidentally in a moment of intellectual fervour in which there are three protagonists: Pietro Bembo, Monsignor Giovanni della Casa, and Elisabetta Querini. I’d heard of the first two, what about you? Querini (circa 1500-1559) was the wife of a rich merchant who frequented and influenced the intellectual ambience of the Veneto. She appears to have been loved by and received gifts from both the cardinal/poet Bembo and Della Casa, whom you may know for his fun book of manners (the Galateo), but he was also the head of the court of the Inquisition. The biographies of these figures are written on the wall and “illustrated” by portrait medals, a painted portrait of Bembo, and publications by each. The kinds of connections between figures and place that open this exhibition and draw us through it are complex. They would be at home in a graduate seminar in art history and are most likely the subject of some scholarly article. 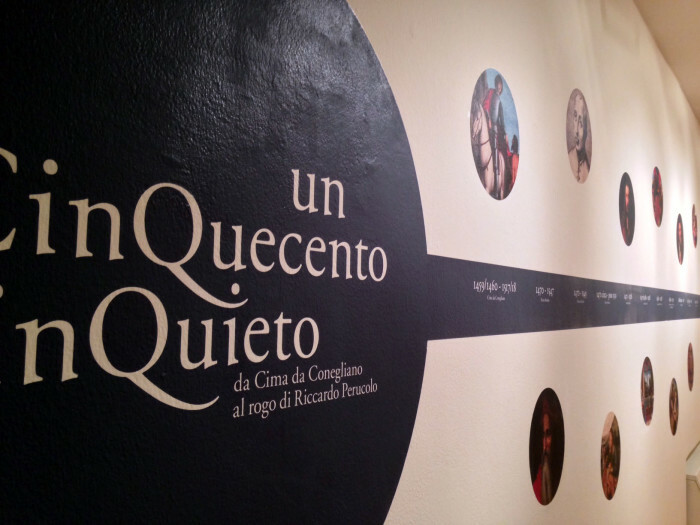 The exhibition wall text is long and written at a university level (only in Italian). The viewer here cannot be passive; it takes effort to read the sometimes long texts, but you stick to it because in reality they say only the most essential things necessary to explain complex concepts. The ingredients to successfully communicate a complex interaction between art and territory are: good wall text, a chronology, and a map. None of these apparatus require technology or particular expense. The introduction is long but essential, setting the stage and building up the thesis. The rooms to follow back up the thesis, paragraph by paragraph. 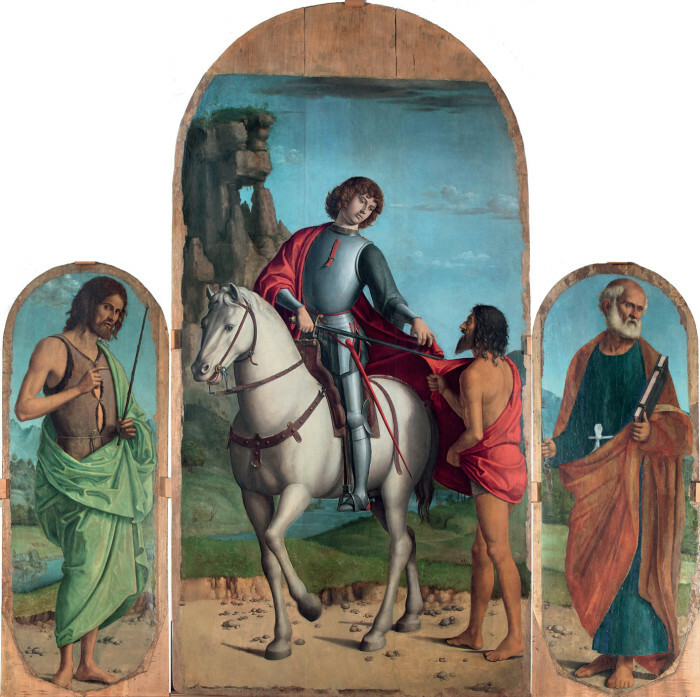 We finally meet Giovanni Battista “Cima” da Conegliano in his delicate triptych for the church of Navolé in the very tiny town of Gorgo al Monticano and observe the style that sets defines the moment. This is actually not spelled out for us, so this is my best attempt at describing it: representing St. Martin giving his cape to a poor man in the center, and St. John the Baptist and St. Peter in the lateral panels, the colour has the luminescence of a Bellini or an early Titian, the forms have something in common with an early Giorgione, and the facial characteristics seem to already show exposure to Pordenone (who would come to this town a bit later). These comparisons to other artists are conclusions the visitor can partially draw from what comes next in the show, though it’s not necessary to categorize the style in this way so much as just to observe it. Pordenone comes to Conegliano in 1511, called by a local patron, the Collalto. 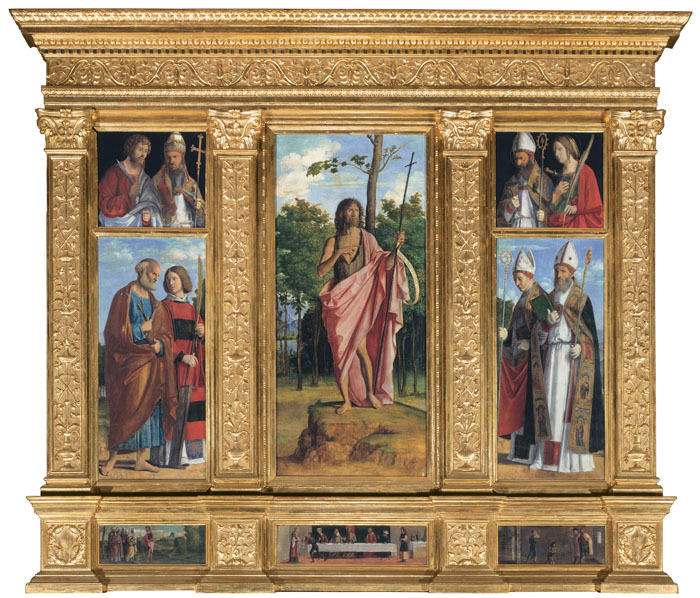 Pordenone’s hometown may be 35km away but he’s already done something of a grand tour of Italy – he was one of the most mobile artists of his time, and he adjusted his style when he was working in Venice or in Rome, conscious of local trends and the desires of his patrons. 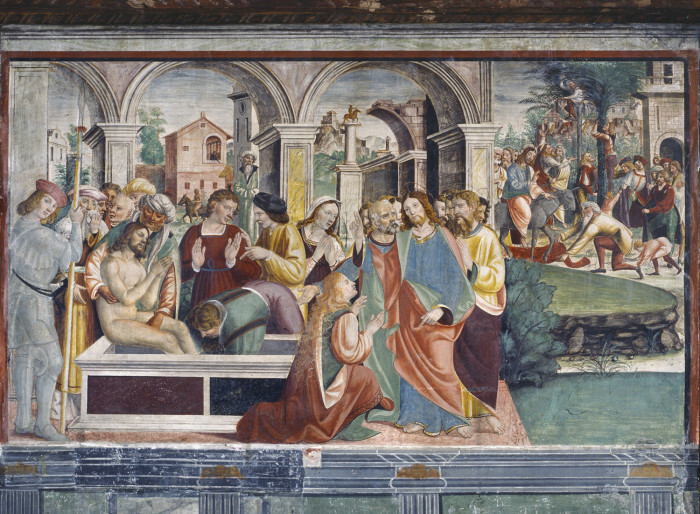 Although he found employment in prestigious centers, he never disdained returning to paint in places like Conegliano. The exhibition shows how this artist influenced the style of locally active artists very specifically through figural types, which I see in the Adoration by Domenico Capriolo (in the Musei Civici di Treviso collection), a lovely panel with a few awkward elements (Mary’s overextended neck and her tiny baby) that nonetheless communicates an emotion, closely linked to the land and the figures who inhabit it. Things go quickly downhill from here, and if the paintings in the final room of the exhibit are rather bland and not satisfying, this is nicely explained by the thesis – that the Counter-Reformation killed not just one artist (the heretical Riccardo Perucolo) but a whole artistic movement connected to this specific place. At the exit we are reminded that the exhibition does not finish here, but continues in a circular itinerary throughout the territory, which would be worth planning a weekend to visit in full. In fact, organized packages are available from the Consorzio di Promozione Turistica Marca Treviso that include 1 night in a hotel, dinner, the exhibit, and a prosecco tasting starting at 99 euros per person – an example of good integration with the local tourism offering. A show like this is the result of good curation with an eye to communication. It takes complex information and processes it in a way that an interested and educated public can understand and learn from it. It enhances local pride by explaining a period of history quite possibly not known by most residents of Conegliano, yet it also brings to light a whole branch of Renaissance art not known to much of the Italian and international public. Not only is the exhibition a model for others to follow in terms of the way content is presented, it makes a strong point about connecting the arts in general to social, religious and political circumstance. Please note: wall text is currently only available in Italian. This review extends the concept of “art and nations” or “national art” that is the topic of this month’s ArtSmart Roundtable, a monthly thematic post by a group of bloggers who, like I, focus on art and travel. While Conegliano is not a nation, it’s a territory, and this article (I hope) demonstrates how closely art and territory can be linked. Please take a look at the links below to read about other territories and their art.